Hey, it’s my turn to roll on the Roly Poly Pinafore Blog tour! I’m super excited to be a part of introducing you to this adorable pattern by Rachael of Imagine Gnats. Back when Rachael was first working on this pattern, I got to be a lucky pattern tester. I was pretty much the worst pattern tester ever, which is extra awful because I rely so heavily on MY pattern testers. But I just didn’t really have any feedback to give besides, “it’s perfect. do it.” Because it was. Perfect. This is the version I made for testing purposes. And also for purposes of cuteness. I have a whole ton of cutesy juvenile printed quilting cottons from Back In The Day when I was into that sort of thing. I’m not as much anymore (not that there’s anything wrong with that! ), so they just gather dust. I figured if I was ever going to use this print, an adorable top for a 1 yr old was the place it should be. But for my Roly Poly Pattern Tour Roly Poly, I wanted to make something a little more special. A friend of mine just had her fourth daughter (actually two friends of mine just had their fourth daughters within a week of one another. What are those odds?) and I needed a baby gift. Roly Poly to the rescue! So, my very favorite thing about reversible clothing is that you can “waste” one side. You see, before I acquired this little gem of knowledge, I never liked reversible clothes. That’s a whole lot of extra work and I’m always going to prefer one side and use it exclusively anyway. But then one year I wanted to make my daughter a birthday shirt. But I didn’t want to waste a whole sewing project on something she’d wear on exactly one day of her life. Lightbulb! And that’s the beauty of reversible clothes: One side is the cute fabric that you want to feature 99% of the time, the other side is pumpkins and ghosts or reindeer and holly or “happy 1st birthday”, or “I lost my first tooth!” or “I can poop in the potty!” or any other fabric/sentiment that will rarely be necessary. It’s also perfect if you want to personalize something with a name but still want to be able to pass it down to siblings, like I did here (modeled by my daughter. Baby Harper will probably need a couple more days before she fits into this). My one little mod to the pattern was to add a small little ruffle cap sleeve to the strap with contrasting fabric. I love me a good ruffle. After they’re said and done, that is. Making them is a different story altogether. This picture is really a gratuitous elbow dimple shot posing as a requisite back view. Pantless is definitely my preferred way to style this top, but you could really pair it with anything. And I’m not sure what’s up with the Bieber hair here, but you can see the ruffles in action. So grab yourself a copy of this (perfect) pattern already! 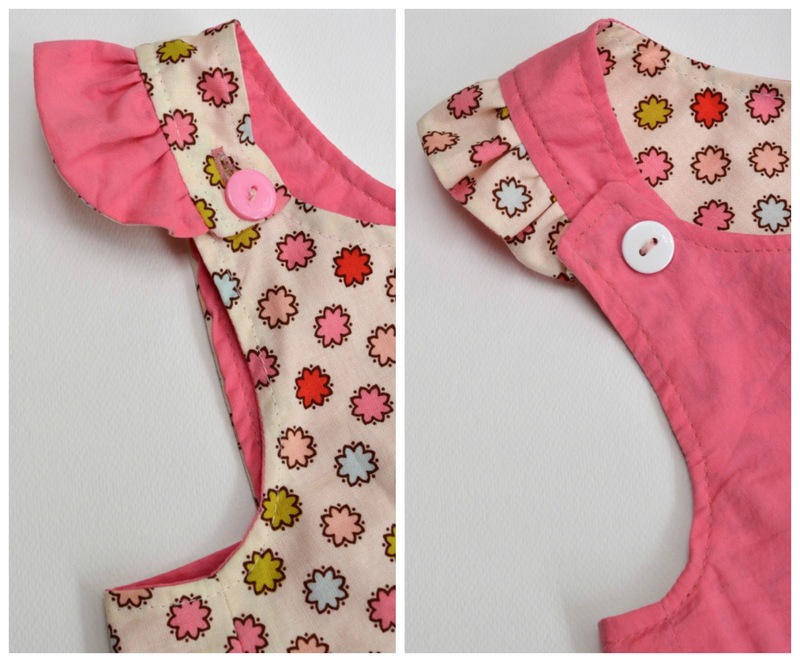 It really is a fun and simple pattern, and the possibilities for cuteness abound. The hardest part will be deciding on what fabric to use. 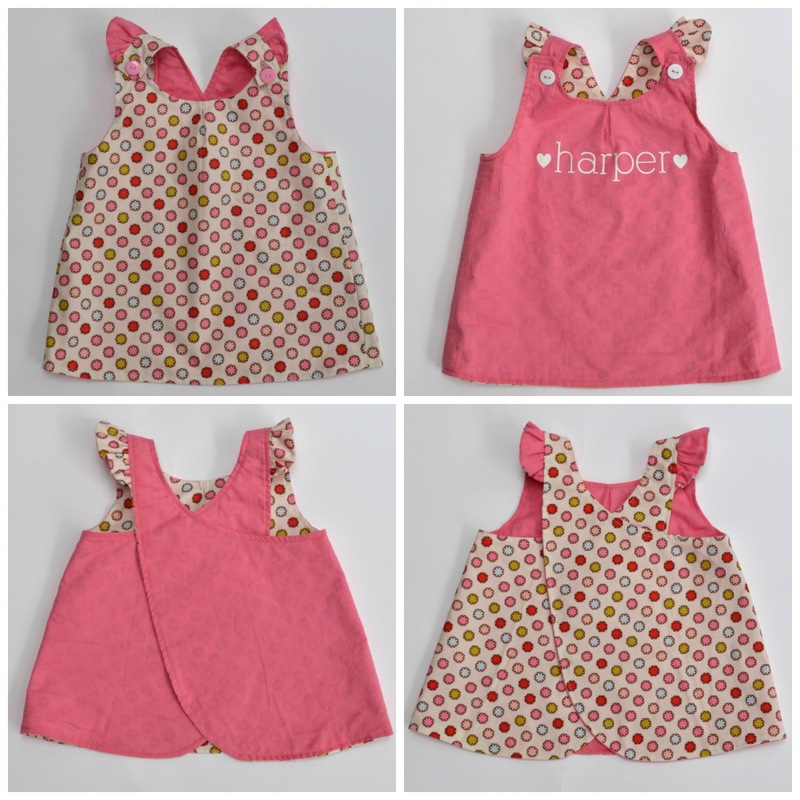 You can buy the Roly Poly Pinafore here and if you need a little inspiration, check out all the beautiful versions in flickr. Be sure to visit all the lovely ladies in the Roly Poly blog tour too! Thanks for letting me roll, Rachael! « Announcing: Skirt Week 2013! I love your version of the roly poly!! The addition of the little flutter sleeves is too cute! Oh you got a lovely Anonymous comment up there :-) Man spam people are weird!!! Very cute! I love your version with the ruffle. to return the want?.I’m attempting to in finding issues to enhance my web site!I suppose its good enough to make use of a few of your ideas!! I love your take on reversible garments, I’m definitely going to apply it in future. I usually end up spending so long worrying about what to use on both sides that it takes more time to choose fabric than sew. The little flutter sleeves are such a cute addition. Such a cute top and I had never thought if using “one time only” fabric for the reverse, so clever! Love the ruffles added as well! Great job! I have the same opinion of “reversible” things – I always pick a favorite and never actually reverse it. Love your take, though. ALSO adore the flutter sleeve addition! Oh those ruffles! I love it even more with them. I can hardly stand the cuteness that is this post! Adorable! Thanks for sharing! This is the sweetest, ever. Super duper cute! I love it bunches!